knottygnome crafts: Hooray for Bronwyn! My Secret Pal 6, Bronwyn, rocks! She is going to be traveling in a few weeks to New Zealand (lucky lucky girl) and so she sent me my final package a little early. And I get to bask in all the goodies! She gave me 400 yards of Schaeffer handpainted pima cotton in the most gorgeous plum/burgundy/green/brown color combo i have ever seen. the cotton feels so soft and shiny. 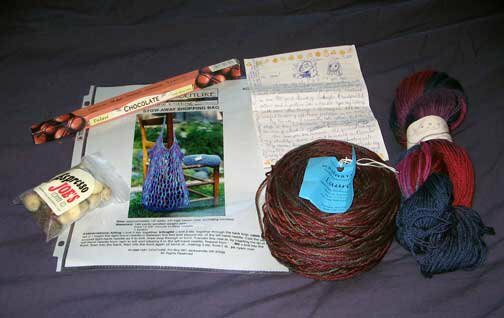 She also included a knitted mesh shopping bag pattern from Oat Couture natural knitting, and a skein of Lorna's Laces Shepherd Sport in a lovely blue/purple/pink combo. I have tried the shepherd sock before, but not the sport weight. i'll have to save it until i find a special pattern for it. she also included some chocolate incense sticks. i'm not always the most avid of readers--i almost tried to eat it until i opened it. but no fear, b/c she also included a little bag of espresso joe's chocolate covered coffee beans. i've already eaten two, but i need to cut myself off. You see, i've already explained this to Bronwyn, but i'll say it again here. my sophomore year in college i bought a 1/8 lb bag of choc covered coffee beans to eat at my leisure. i only ate one per day. i savored them. they were great. but at the same time, for some reason, i was having the most wild mood swings. and b/c i was a psych major, of course i concluded that i had bipolar disorder with extremely rapid cycling. finally, i realized that my highs and lows corresponded nicely with my consumption of coffee beans. the day i put it all together, i was aiming a bean towards my mouth when it hit me. i stared at the evil coffee bean and then threw it and the remainder of the bag in the trash. and haven't had any since. nor do i have any sense. but anyway, i am much more addicted to coffee now than i was then, so as long as i limit myself, i should be ok.
Bronwyn is leaving it up to me to find her blog. it should be a daunting task. have you seen the SP6 participant list? i just hope i find it before she leaves for new zealand. in the meantime, thank you thank you thank you! You are an awesome pal! I'ma big duh-head, I forgot the most important part of our gift! 'll mail it out as we leave in Dec. so you'll have another gift after all. Glad you liked it, you were a fun pal!